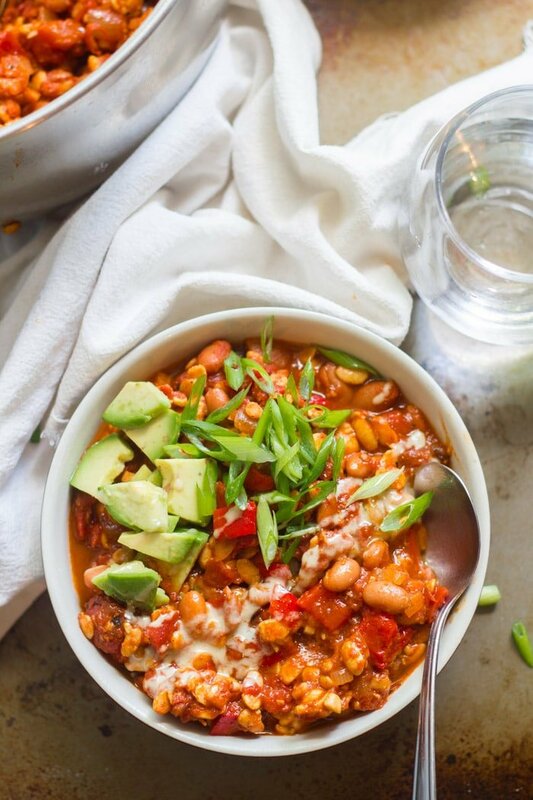 Hearty pinto beans, fire roasted tomatoes, and lots of smoky and spicy seasonings go into this satisfying and delicious vegan tempeh chili. Tempeh is weird. Yes, I’m just realizing (or admitting) this after almost five years of blogging and twenty years (yikes!) of eating tempeh. See, it took me a while to realize that temeph isn’t everyone’s jam. The first time I tried it, I absolutely loved it. I thought I’d hit the vegetarian food jackpot. Oh, and at that time I hated tofu. So maybe I’m weird too. It seems like most people are the opposite. When I introduced my husband to tempeh shortly after we met and he wasn’t into it, I thought there was something seriously wrong with him. And the guy loved tofu. It wasn’t until I started blogging and getting a million questions from people on how to make tempeh palatable that I realized maybe my feelings about tempeh aren’t the norm. Guys, I’d seriously just cook up some cubes of this stuff with zero seasoning and find it delicious. But for most of you guys it’s a tad bitter. So I did some exploring and taste testing and I get what you’re saying at this point (even though I still love tempeh served any way it can possibly be served). My husband has helped out a bit, and when he’s really into a tempeh dish, I know it’s a good one. I’ve figured out a couple of tricks. In lots of dishes it helps to steam the tempeh. 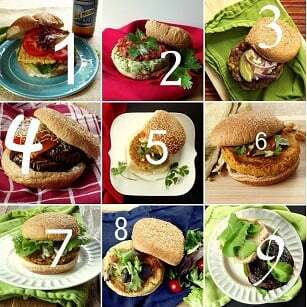 Okay, I didn’t figure this out myself, but if you Google anything related to how to make tempeh less bitter, you’ll find a bunch of people who are more innovative than me telling you to do this. So I did it, and it definitely mellows the flavor. Most people seem to advise sticking your tempeh into a steaming apparatus and letting it go for ten minutes or so, but I’m lazy and perfectly okay with microwave use, so I just cut up my tempeh, wrap it in a wet paper towel, stick it on a plate, and zap for four minutes. That’s it! And it works. The other thing is this: use crumbled tempeh in really flavorful, saucey dishes. You get all the benefit of the crumbly texture, but the flavor of the sauce dominates. And if the recipe calls for a decent amount of simmer time, you probably don’t even need to steam the tempeh, because all that simmering does the job! 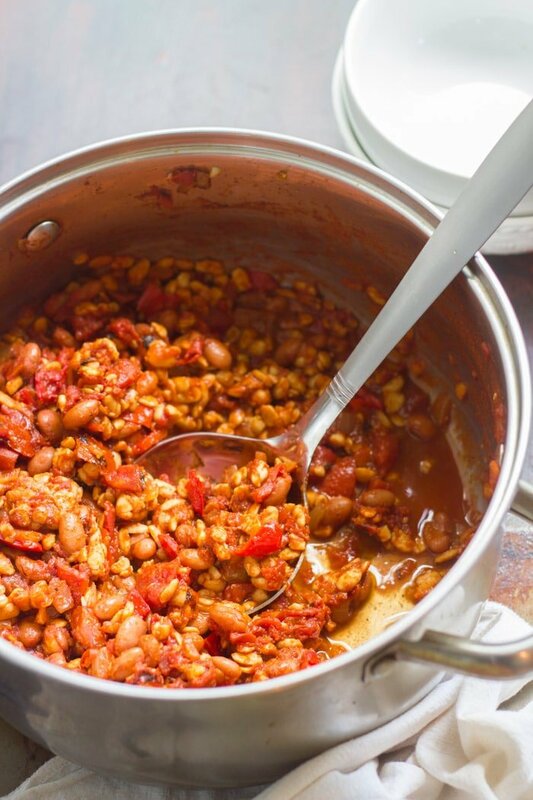 And that’s why tempeh is perfect for chili. 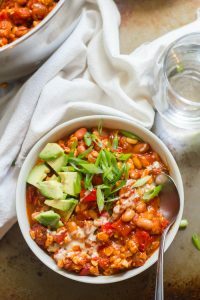 It has a nice crumbly texture that’s perfect in chili, a nice long simmer time (the longer, the better, in my opinion), and it’s surrounded by a super flavorful saucey base. 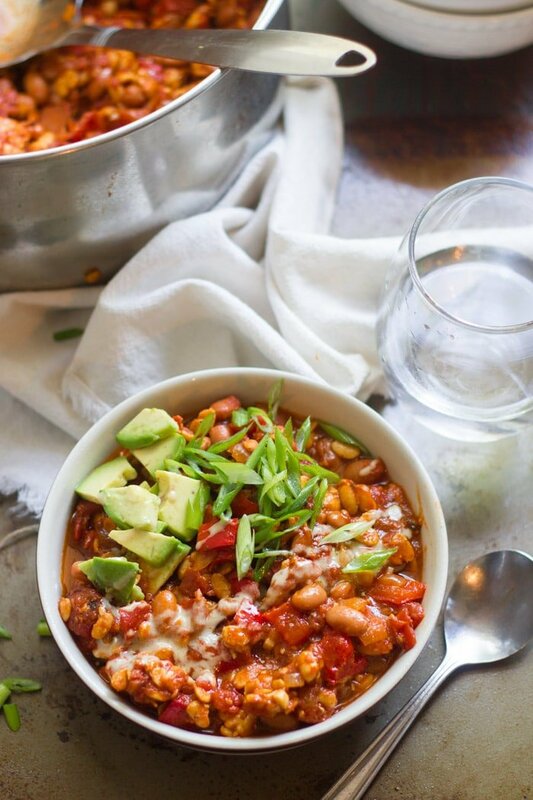 I went and included lots of smoky flavors in this tempeh chili — bell peppers, fire roasted tomatoes, and a touch of smoked paprika. I made mine with a good deal of heat too, but it’s up to you whether you want to do the same. 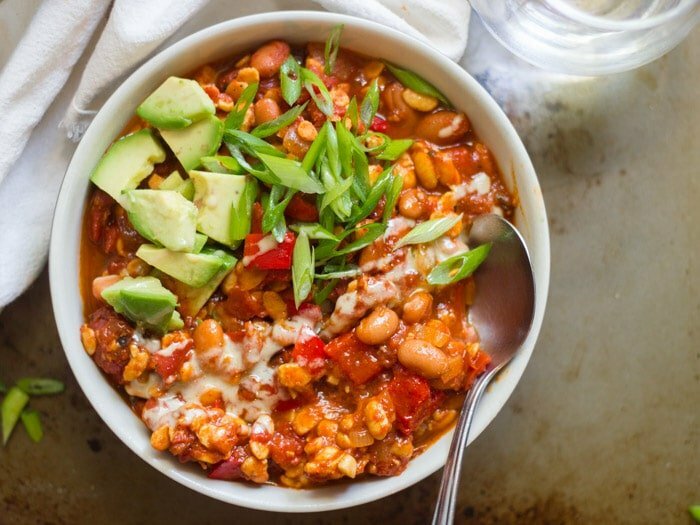 Pinto beans make the chili extra hearty and carrots add some sweetness. With fall nearly upon us I’m pretty excited about making this one again and again during the cooler months. Coat the bottom of a large pot with oil and place it over medium heat. When the oil is hot, add the onion and sauté for about 5 minutes, until soft and translucent. Add in the bell pepper, carrots and temeph, and continue to sauté until the veggies begin to soften, about 5 minutes. Add the garlic and continue to sauté until very fragrant, about 1 minute more. Stir in the tomatoes, pinto beans, soy sauce, chili powder, cumin and paprika. Raise heat and bring to a boil. Lower the heat and allow the chili to simmer until it's nicely thickened up and the veggies are tender, about 20-25 minutes. You can let it go a bit longer if you'd like the flavors to meld even more, just add some water if it becomes too thick. Remove from heat and season with cayenne pepper or hot sauce and salt and pepper to taste. Adjust any other seasonings to your liking. Haha! That’s so funny because I’m the same way! I LOVE bitter foods, but with tempeh I find the bitter flavor is super subtle while other people seem to think it’s overpowering. I just made this and it is DELICIOUS!!! I couldn’t wait for it to simmer!! On my second bowl now!! Love the flavors!! Thank you!! 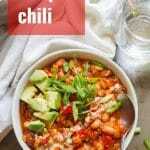 I just made this chili and it is delicious! I am a recent vegan and I’ve subscribed to your newsletters and have selected two recipes from your website to make this week (this and the butternut squash chimichangas). Next time I make this will be for my husband and his buddy for football and I will definitely double the recipe! I’m so glad you enjoyed it!! Thanks Angie! Sounds yummy, going to try this tonight. Just wondering if you could cook this in a crockpot? I think it would work! I’m not sure how long to cook it though, so I’d say just keep an eye on it. I’d love to hear how it turns out!